On the 6th (Thu), tour the pleasant surroundings at Praia da Carriagem and then enjoy the sand and surf at Praia Vale Dos Homens. To find traveler tips, reviews, maps, and other tourist information, go to the Rogil road trip planner . Brasilia, Brazil to Rogil is an approximately 14.5-hour flight. Traveling from Brasilia to Rogil, you'll lose 3 hours due to the time zone difference. Traveling from Brasilia in June, you can expect nighttime temperatures to be a bit warmer in Rogil, with lows of 21°C. Finish your sightseeing early on the 6th (Thu) so you can travel to Albufeira. 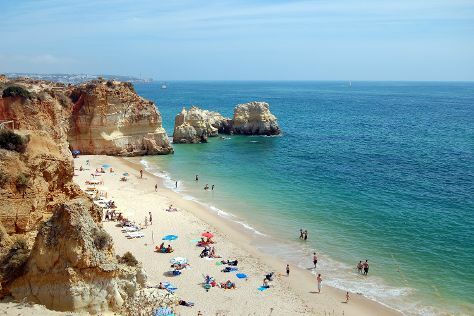 We've included these beaches for you: Praia Da Rocha and Praia da Marinha. Change things up with these side-trips from Albufeira: Portimao (Barranco das Canas Beach, Tres Castelos Beach, & more), Carvoeiro Boardwalk (in Carvoeiro) and Garrao Nascente Beach (in Vale do Garrao). It doesn't end there: enjoy the sand and surf at Falesia Beach and stroll through Olheiros de Agua Doce. To see where to stay, photos, ratings, and more tourist information, you can read our Albufeira vacation planner . You can drive from Rogil to Albufeira in 1.5 hours. June in Albufeira sees daily highs of 32°C and lows of 21°C at night. Wrap up your sightseeing on the 11th (Tue) early enough to travel to Madrid. Get some historical perspective at Royal Palace of Madrid and Plaza Mayor. Let the collections at Prado National Museum and Museo Nacional Thyssen-Bornemisza capture your imagination. Venture out of the city with trips to Toledo (MQM Museo del Queso Manchego Toledo, Catedral Primada, & more). There's much more to do: explore the world behind art at Museo Nacional Centro de Arte Reina Sofia, steep yourself in history at Museo Cerralbo, take an in-depth tour of Centro Sefarad Israel, and take in the spiritual surroundings of Real Basilica de San Francisco el Grande. To see traveler tips and tourist information, refer to the Madrid attractions app . You can fly from Albufeira to Madrid in 4.5 hours. Alternatively, you can do a combination of bus and flight; or drive. The time zone difference when traveling from Albufeira to Madrid is 1 hour. When traveling from Albufeira in June, plan for a bit warmer days in Madrid, with highs around 36°C, while nights are about the same with lows around 19°C. Wrap up your sightseeing on the 15th (Sat) to allow time to travel to Marrakech. Do some cultural sightseeing at Ben Youssef Madrasa and Saadian Tombs. Get some historical perspective at Bahia Palace and Koutoubia Mosque and Minaret. There's much more to do: admire the natural beauty at Jardin Majorelle, relax and rejuvenate at some of the best spas, see the interesting displays at Marrakech Museum, and explore the world behind art at Maison de la Photographie de Marrakech. To see more things to do, ratings, maps, and tourist information, go to the Marrakech driving holiday planner. Traveling by flight from Madrid to Marrakech takes 5 hours. Alternatively, you can do a combination of car and ferry; or do a combination of train and bus. The time zone changes from Central European Time to Western European Time, which is usually a -1 hour difference. In June, daytime highs in Marrakech are 39°C, while nighttime lows are 20°C. Finish up your sightseeing early on the 18th (Tue) so you can travel to Lisbon. Get a sense of the local culture at Jeronimos Monastery and Castelo dos Mouros. Your inner history buff will appreciate Castelo de S. Jorge and Belém Tower. Explore Lisbon's surroundings by going to Sintra (Park and National Palace of Pena & Quinta da Regaleira). There's much more to do: wander the streets of Alfama, shop like a local with Museu Calouste Gulbenkian, explore the world behind art at National Tile Museum, and don't miss a visit to Rossio Square. To see other places to visit, maps, where to stay, and more tourist information, you can read our Lisbon trip itinerary planner . Traveling by flight from Marrakech to Lisbon takes 2.5 hours. Alternatively, you can do a combination of car and ferry; or take a bus. Expect a bit cooler weather when traveling from Marrakech in June: highs in Lisbon hover around 32°C, while lows dip to 18°C. Finish your sightseeing early on the 22nd (Sat) to allow enough time to travel to Brasilia. Kick off your visit on the 23rd (Sun): look for all kinds of wild species at Atlantic Forest South-East Reserves, then contemplate in the serene atmosphere at Santuario Dom Bosco, then take in the spiritual surroundings of Catedral Metropolitana, and finally take a leisurely stroll along Pontao do Lago Sul. For maps, traveler tips, ratings, and more tourist information, you can read our Brasilia online tour itinerary builder . Fly from Lisbon to Brasilia in 12 hours. You'll gain 3 hours traveling from Lisbon to Brasilia due to the time zone difference. In June, daily temperatures in Brasilia can reach 30°C, while at night they dip to 16°C. Wrap up your sightseeing on the 23rd (Sun) to allow time to travel back home.